Invest monthly to help individuals and families in Niagara break the cycle of homelessness and remain securely housed. Start Your Monthly Giving Today! When you give monthly, you are partnering with Bethlehem to provide stable affordable housing and support services in Niagara. 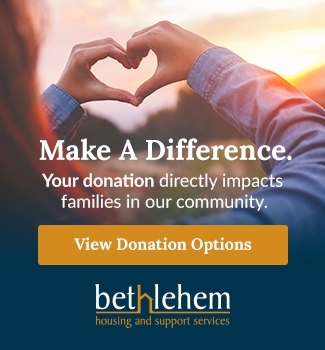 Bethlehem’s monthly giving option is affordable, flexible, effective and convenient. Affordable and Flexible - For less than $1/day ($30/month) you will help to provide one family with community outreach support services. 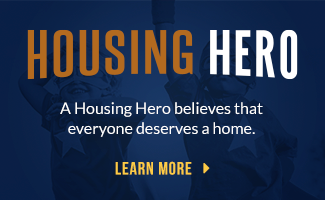 For less than $2/day ($60/month) you will help to ensure that one family living in our permanent housing has on-site support and advocacy services. Effective - Your monthly gift provides a steady source of income that will make it possible for us to continue to walk along side of those who are on a journey to a better life and stable housing. Convenient - You can choose to make your monthly gift automatically by credit card and determine the amount of your gift. If you give monthly by Mail or by Phone your monthly withdrawals will be made on, or about, the 15th of each month. You will receive a single tax receipt for your annual donations at the end of each calendar year. Receipts are normally sent by mail in January of each year. At Bethlehem Housing and Support Services we understand that ending homelessness is more than just providing a roof over someone’s head. It is also about bringing people to a place of strength and independence. Our transitional and permanent supportive housing accomplishes that.